The Brown Marmorated Stink Bug (BMSB), Halymorpha halys, is an invasive, exotic insect pest recently introduced into the United States (Pennsylvania, 2001), and even more recently in Wisconsin. The first detections of BMSB in Wisconsin were adults in March 2010. Two additional adults were also collected the following November, one each in Dane and Manitowoc Counties. Unverified reports of BMSB have subsequently come from Polk and Ozaukee Counties. Wisconsin is listed as a state with “sightings only” because only the adult life stage was documented. Neither eggs nor nymphs have been documented in our state. This status is likely to change as more people will be monitoring and scouting for this insect in the coming growing season. Additionally, the Wisconsin Department of Agriculture, Trade and Consumer Protection will continue its monitoring program. BMSB has piercing sucking mouth parts and has a very wide host range which includes field, vegetable, fruit and ornament crops. It additionally has been a nuisance invading homes and other dwelling looking for overwintering sites. To date, the majority of damage has been found in the east coast and mid-Atlantic states on fruit crops. However, significant damage has also been found on field crops in those same areas. Because of the recent detections in Wisconsin, it is worth your time and effort to be aware of BMSB and its potential for damage in Wisconsin. The BMSB has yet to be observed causing damage to field crops in the Midwest. It has been observed causing economic damage on corn and soybean in the Mid-Atlantic States. Adults and nymphs feed on plant juices and/or on immature seeds. In corn, they feed thorough the husk and inhibit developing kernels. In soybeans they feed through the pod which results in shrunken and or shriveled seed. The adult BMSB is very similar in size, shape and appearance to our native stink bugs, especially the brown stink bug. BMSB is approximately 5/8 to 3/4 inch long and has the typical “shield” shaped appearance of other stink bugs. However, there are identifying characteristics which are useful for accurate identification. Identifiable characteristics of the adult BMSB are 1) alternating light to brown spots on the outer edge of their abdomen 2) antennae with alternating brown and light bands 3) eyes which are dark red and 4) the upper edge of the shield is smooth. Many of the native stink bugs have a “toothed edge”. BMSB do have brown/white mottling; however, this characteristic does not separate it from our native brown stink bug. 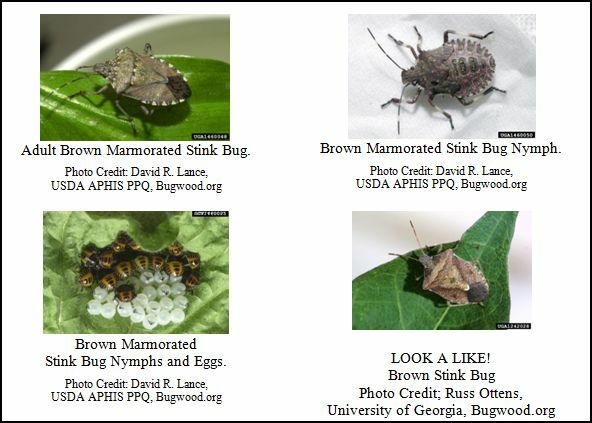 Other species of insects such as squash bugs and leaf footed bugs may be similar in color to BMSB, but they do not have the characteristic shield-shape of stink bugs. If you are unsure of your diagnosis, please collect specimens (or high quality, clear digital pictures) and bring them to your local county extension agent for accurate identification. The immature stages, called nymphs, are smaller than adults and range in size from a pin head to ½ inch in length. Nymphs are oval and have dark red eyes similar to the adults. Nymphs do vary in color and appearance with age. Initially, they range in color from a yellowish red to a creamy white with reddish spots just prior to turning into adults. BMSB eggs are light green to yellow, barrel shaped and found in clusters of 20-30 eggs on the undersides of leaves.